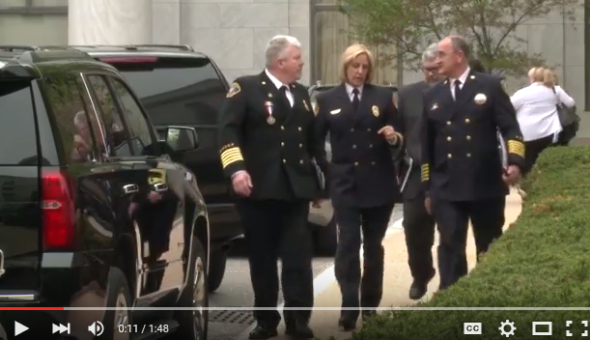 Sneak peak of the video highlighting Fire Chief G. Keith Bryant, president and chairman of the board, Fire Chief Rhoda Mae Kerr, first vice president, and Fire Chief John Sinclair, second vice president, meeting with several members of Congress, key congressional staff and administration officials on April 15–16 in Washington, D.C.
Fairfax, Va. – (April 15, 2015) The top elected leaders of the International Association of Fire Chiefs (IAFC) are meeting this week with key congressional and senate offices to raise awareness on Capitol Hill about issues critical to the association’s 11,000 members and the U.S. fire service. Fire Chief G. Keith Bryant, president and chairman of the board, Fire Chief Rhoda Mae Kerr, first vice president, and Fire Chief John Sinclair, second vice president, are meeting with several members of Congress, key congressional staff and administration officials on April 15–16 in Washington, D.C. 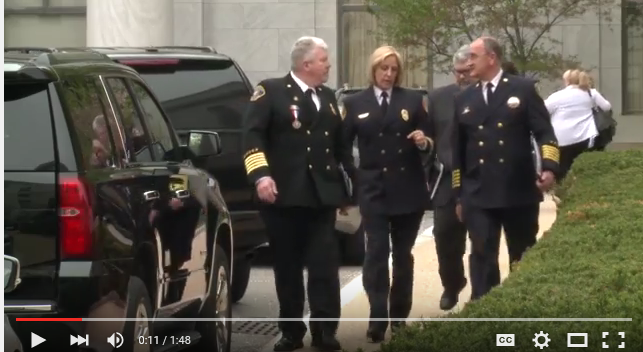 In particular, the IAFC leaders are seeking congressional support of federal programs that assist the nation’s firefighters and EMS personnel. The fire and emergency service responds to more than 29 million incidents each year, covering structural fires, hazmat incidents, wildland fires, EMS calls and many other emergency-response situations. Many federal programs play a vital role in ensuring that the nation’s fire departments are properly trained, equipped and prepared to meet their daily challenges and address all natural and manufactured threats to the nation. More information about the IAFC’s legislative priorities is available on the IAFC website.